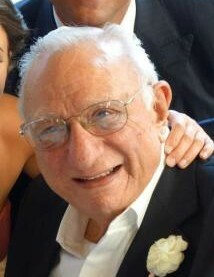 Obituary for Salvatore J. LaBricciosa | Vraim Funeral Home, Inc.
Salvatore J. LaBricciosa 1-20-19. Husband of the late Adeline. Beloved father of Joseph (Maureen), Sal (Kathie), David (Gina), and the late Robert. Grandfather of Elise (Matt), Nicholas(Molly), Michelle (Huntley), Kristen, Stephen, Robert, Rachel, Dominic, Michael, and Gabrielle. Also survived by brother Albert. His mass of Christian burial will be 11am Friday at St. Pius X R.C. Church 220 Lawrence Rd. Broomall, Pa 19008. Viewing 9am to 11am prior to service in church. Interment: St.'s Peter and Paul Cemetery. In lieu of flowers memorial contributions may be made to The wounded Warrior Project. P.O.Box 758517 Topeka KS, 66675.